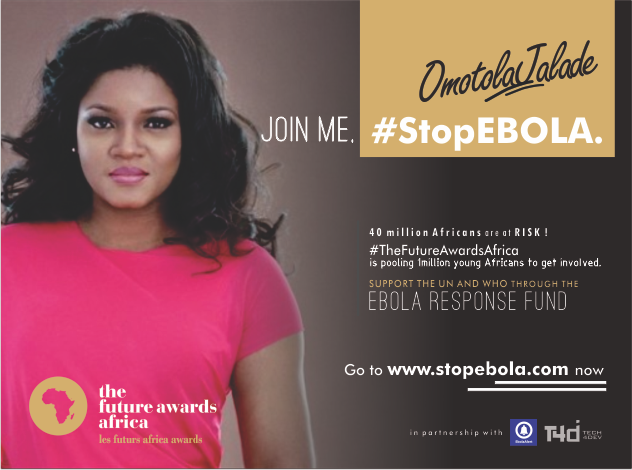 Africa’s leading creative icons - Genevieve Nnaji, Omotola Jalade-Ekeinde and Asa have been announced by The Future Awards Africa as the leading influencers for its global #StopEbola campaign to pool 1 million young Africans to act against Ebola in Liberia, Sierra Leone and Guinea. 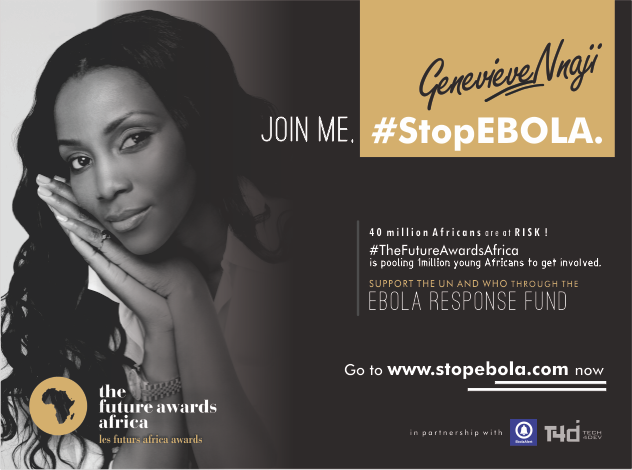 The #StopEbola campaign will get young Africans to support the World Health Organization by donating social media updates and a minimum of $25 between now and the awards date via the portal www.stopebola.com. The funds go directly to the United Nations Ebola Response Fund. Other influencers include CEO of Mara Group, Ashish Thakkar; CEO of Paga; Tayo Oviosu, Deputy Director of the British Council, Ojoma Ochai. Other influencers include Deputy Director of the British Council Nigeria, Ojoma Ochai; Tu Face Idibia, Van Vicker, Joselyn Dumas, and Lanre Da Silva Ajayi. Also included are Dayo Israel, Denrele, Dakore Akande, Juliet Ibrahim, Funke Akindele, Omoni Oboli, Ohimai Atafo, Joseph Benjamin, Ice Prince, MI Abaga, Omawumi, Waje, Lynxx, Yemi Adamolekun, Gbenga Sesan, Kunle Afolayan, Osas Ighodaro, Yegwa Ukpo and Kathleen Ndongmo. 3. Click on the DONATE button to donate directly to the UN’s Ebola Response Fund. You should also put up the #StopEbola flyer on your Instagram, Facebook, Twitter and Phone DPs everyday from now to 7 December. You can download the flyers on www.stopebola.com. 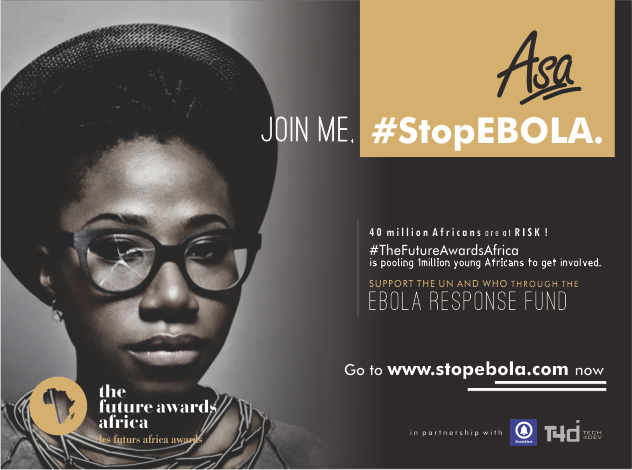 The #StopEbola hashtag campaign kicks off officially on Tuesday, 11.11.2014 at 12PM.